I’ve been craving foods from the Mediterranean recently. This was my answer to the cravings. 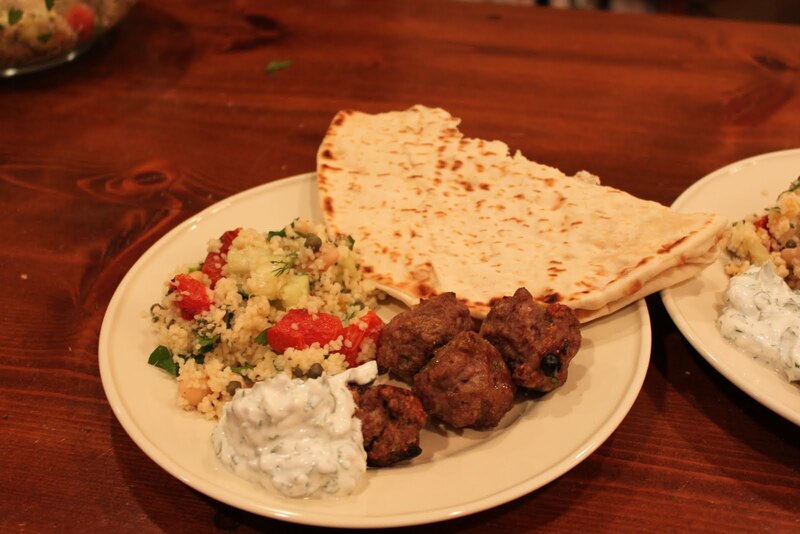 I created this salad to go with the mint yogurt sauce, flat bread, and lamb meatballs shown below (I got the recipe from Real Simple). This salad is quick, healthy, and delicious the next day. I decided to roast the tomatoes because its impossible to get good tomatoes in the winter. To roast the tomatoes, heat the oven to 425 and place the tomatoes on a baking sheet with olive oil and salt and pepper. Heat for 20 minutes and then let cool. Heat the chicken broth to boiling. Take off the heat and add the couscous. Cover with a lid for 10 minutes. While the couscous cooks, prepare the rest of the ingredients and place in a medium sized bowl. When couscous has sat for 10 minutes, fluff with fork and allow to cool for a few minutes. When cooled add to bowl with the rest of the ingredients. To garnish, add the pine nuts, feta cheese, and a few swirls of olive oil.